Initial playlist and presentation for ABC/Soundproof. Many thanks to Julie Shapiro and Miyuki Jokiranta for this great radio opportunity. And special thanks to Aurélie Lierman for her precise and kind attention to the english text below ! « Meanwhile In Fukushima » is an audio collaborative project led by Dominique Balaÿ. It aims above all to throw a life line between here and there. Since 2011, more than 50 contributions have added sense to this project that met the interest of radio channels (such as France Musique, France Culture, RTS, RTBF, Radia network…) and different artistic programs, mainly in France and Japan, but also in more than 20 other countries … and today Australia ! I live in the South of France (in Provence precisely) and I am the founder and artistic director of WebSYNradio. I am also involved in various editorial and artistic projects in which I each time search for open and collaborative forms. In all those different projects, I am preoccupied by an investigation of ‘media’ in itself: what to focus on? what listening experience should be created, evoking what kind of dialogue? how to engage the outside world ? I do like to use the medium radio in particular, and sonic phenomena in general. Radio is for me a refined and autonomous tool: perfect for international investigation and in the best case also a translation of the in-timely. I hope that I always maintain enough liberty and openness in this approach. At the moment of Fukushima 3/11 I already was in touch with some Japanese artists, as I had had the opportunity to produce programs for WebSynradio. But, though it was my childhood dream, I had never had the chance to go to Japan myself. One of my ancestors had been a counselor of the Shogun. He built the arsenal of Yokohama, and his epos at the dawn of modern Japan has nourished our humble « family legend ». There’s even a small museum dedicated to him over there. On top of this quasi atavism, I have gotten a political sensibility about certain rather ecological subjects. So back in 2011 I was instantly worried about what was happening over there, first the tsunami, then the explosions in the nuclear power plant of Fukushima Daiichi. I have lived those events in realtime like every one else in that time. I felt like we were getting close to something terrifying beyond human scale. Including the media’s approach about the catastrophe and everything else that happened in terms of political errors and bad decision making in the management of the crisis. It was pretty overwhelming for days in a row. But luckily I found a way to not be emotionally crushed by what was happening. Right in that moment I was actually finishing a broadcast for webSYNradio with John Zorn who told me he was going to organize a benefit in his club in New York. John Zorn invited me to record the event and to broadcast it on webSynradio. Me going to New York to that unforgettable benefit event back in summer 2011 was the actual starting point of the project « Meanwhile, in Fukushima ». After broadcasting the benefit event at The Stone I felt more and more involved and I wanted to continue to be available. « To help » is a maybe too big word, but at least to not remain passive, as was the case with Tchernobyl where I was too young to fully understand what was happening. Even if I am not a militant, I just really wanted to do ‘something’. And that’s how the idea of going to Fukushima City took shape. I wrote an intention declaration in which I explained my project: collecting recordings from Fukushima City and to invite artists to work on those recordings. That invitation was going around in France and that’s how I got the support from INA/GRM, that historical institution where electro acoustic music has been invented and developed throughout the twentieth century. It’s studio’s are in the headquarters of the national radio broadcasting corporation in Paris. INA/GRM and it’s co-director Christian Zanesi offered me the possibility to organize residencies for 4 artists. The project had been launched! In the wake of all these activities I took off for Japan and resided one month in Tokyo and Fukushima City. I collected nearly 30 hours of field recordings and lots of interviews. I met so many people, and some of them became good friends. Those friendships have inspired me up till today. They give me the faith and confidence to continue « Meanwhile, in Fukushima » even if in terms of finance it is a precarious project. Tomoko Momiyama (JP), Carl Stone (US), Bérangère Maximin (FR) and Joachim Montessuis (FR) are the four artists who have been part of the artist residencies at INA / GRM. Their participation offered me a variety of approaches: as I felt on the spot, there is not a single way to react and respond to the Fukushima nuclear disaster Daiichi, but a multiplicity. I am pleased that the listeners of Soundproof and more generally the Australian public can discover the sonic contribution they have created especially for the project. I have selected three other contributions to expand the panorama: by Aurélie Lierman (BE/RW), Roxanne Turcotte (CA) and Cristian Vogel (UK), all three are very different. These last three pieces of the selection are spontaneous contributions, and I want to take this opportunity to say that the call for contributions to the project is still open! This piece was created by Tomoko Momiyama partly at INA / GRM during her artist residency, summer 2012. Carl Stone introduced me to Tomoko Momiyama, a young composer, riding on a set of artistic practices and cultures (she lives in Japan and studied musicology at Stanford University USA) ). We met several times in Tokyo. She gave me some valuable contacts (especially Koji Nagahata, a professor from the University of Fukushima, whom we still regularly work with). Tomoko and me had even planned a trip to Fukushima together, which in the end didn’t take place (unfortunately). So we each visited Fukushima separately. She took the opportunity to make her own field recordings which she used in her work. With great sensitivity and great modesty, her contribution translates corruption and profound change in the relationship with Nature caused by the nuclear disaster. This piece was created by Carl Stone at INA / GRM during his artist residency, in September 2012. The first artist that I invited to INA / GRM was Carl Stone, American composer, pioneer of electro acoustic since the 70s, and Japan lover who also lives there six months a year. 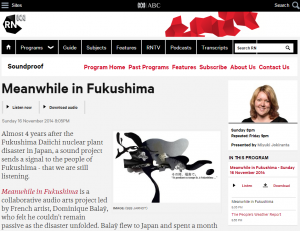 Prior to our Fukushima collaboration, we had worked together on two programs for webSYNradio. In 2012, Carl got convinced he had to take a position towards this catastrophe that generated a lot of trouble in Japan. A catastrophe that was arousing an amazingly strong reaction from a community that is usually reluctant to protest. It is those protests and the profound changes in Japanese society as a consequence that got Carl interested to take action too. His piece is dedicated to the victims of the disaster, and clearly depicts the events that took place in Tokyo as a response to the inertia and also the manipulation of the population by the Japanese politics and mass media. However, in several interviews conducted together (and available on the project website), Carl Stone recalls that this nuclear disaster has extraordinarily complex impacts, and it would be a mistake to judge too hastily the peoples’ reactions. His composition reflects this complexity, while always keeping the victims of the disaster in mind, even though the government’s official position is that this nuclear disaster has made no victims at all. This piece was created by Berengere Maximin & Colin Johnco at INA / GRM during artist residency, summer 2012. I got Bérangère Maximin involved thanks to John Zorn (again ! ): Being French I already knew her work and we even once worked together for a program at webSynradio. A few years earlier, she had released her first album at Tzadik, John Zorn’s label, we talked together about this album and her work and that’s how we connected! For me, it was appropriate to invite an artist who had not expressed an opinion on this subject (Fukushima), and in her work rather reflects a form of musicality very cheerful, non-discursive, almost dancing. Bérangère (who brought Colin Johnco in the project) did not give me the recipe of her composition, but this is a composition that probably only works on a musical and abstract level. She didn’t make any use of my field recordings that were available on the Fukushima website. This piece was created by Joachim Montessuis at INA / GRM during his artist residency, summer 2012. Since 1993 Joachim Montessuis has been developing a transversal sonic poetry praxis focused on experimental voice processing and immersive concert installations. With Joachim, my idea was to solicit input from a poet. I love his work for a very long time, he is very active (even as an activist !) with sound poetry(just like electro acoustic music, another French tradition). His experimentations with noise music are very interesting. Through these experimentations, he questions the concept of the inaudible/ audible. Which for me strongly echoes this particular aspect of the nuclear disaster: its invisibility and our difficulty to perceive the reality of a still ongoing disaster. For his contribution, Joachim borrowed a large amount of material from the open sound library from the Fukushima website, and processed them till the different samples become indistinguishable. The result is very expressive and poetic, I expected no less from him! Aurélie Lierman (BE/RW) is an award winning composer, radio artist and vocal artist. She had two album releases in collaboration with the British cult-group Nurse With Wound ( [SIC] 2013, “Santoor Lena Bicycle” 2014). Field recordings and human speech are the backbone of her work. I discovered Aurélie Lierman’s work half a year ago at Monophonic 2014, a radio art festival and competition in Brussels (Belgium). I was part of the jury there and I was literally blown away by « Anosmia », her radio piece about the Rwandan genocide: very hybrid and very open towards many horizons, with an incomparable strength and power. « Anosmia » actually won at Monophonic the first prize in unanimity. Aurélie has discovered my project about Fukushima during that Monophonic festival and wanted to contribute with an idea that would be true to her main artistic focus by exploring the sonic qualities of Japanese voices. The version proposed here is the electronic tape version. In a live concert situation there’s also a violist playing along and reacting to the electronic soundtrack. Aurelie has conceived the composition as a piece of land art. So ideally the performance is not on the radio, not in a concert hall, … but in full nature at night next to a big water mass so that the composition can intertwine with the sound of natural elements such as wind, water and other accidental environmental events. Roxanne Turcotte, is a canadian artist and brilliant composer. According to her, the Fukushima disaster is an event to think together and that should not be left to the sole discretion of experts. She has created a beautiful composition based on compositional structures of Japanese traditional music. Cristian Vogel is a world renown music producer – especially for his electro music from the 90’s, check out his remixes of Radiohead, Maximö Park, Thom Yorke or B.O of Black Swan … Nowadays he’s into creating electro acoustic and experimental compositions. He wanted to participate in the project to show his empathy towards the Japanese people. The starting point of his composition is very original: it was generated by oscillator banks tracking the infra-red heat radiation emitted by the flame of two candles and tracked using Nintendo WiiMote IR camera. We thank him deeply for his enlightening contribution!